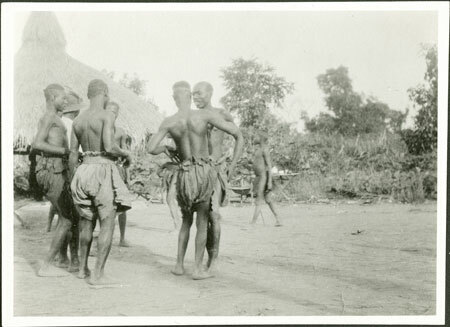 A group of men in a rough circle dancing in a compound, with a cooking shelter to the left. Beyond can be seen a small table and rudimentary ?basin, possibly used by Evans-Pritchard. Morton, Chris. "Zande male dancers" Southern Sudan Project (in development). 03 Jan. 2006. Pitt Rivers Museum. <http://southernsudan.prm.ox.ac.uk/details/1998.341.467.2/>.